In automotive manufacturing many new materials are considered to extend the life of all materials found across the spectrum. Plastics, Paints, rubbers, and coated metals all have technology built within however they are still susceptible to outside environmental damage. Ceramic based coatings crush the challenge of keeping up with all of them, especially on more delicate surfaces. We have a 3 pronged approach to these challenges as you will read. From paint correction, coating applications, and the aftercare, we have accurate and always current information technology and techniques to take on this mission.. It is quite common to see most new vehicles with pre-mature surface damage, gathered during the handling process before delivery. Truth be told, it happens in all brands, all dealers. All vehicles will go through a visual inspection upon arrival at our facility before making recommendations on corrective measures. Paint correction is common on 80 – 90% of the vehicles brought through our facility and is key to a fresh start and level playing field before any protective coating is installed. Part of the impact comes from a finish that is true and corrected as it stands before our eyes. Performing intensive paint correction will remove most, to all defects. This component of the enhancement process is to be followed by our ultra-premium protective solution. Master – detailers are amazing and they do exist. However, we are surface solution artists. Our process is unique, surgical, and quite impressive to those who care about the details. We go Beyond the Details insuring there is no question on quality when it comes to delivery. Plastics used by any manufacturer are prone to early degradation and therefore need superior Protection. Most common signs of damage are discoloration and sometimes mildew growth inside the surface more commonly seen on rubbers. The goal is not to hide or mask, but to restore by stripping “dead skin” and then treating with a quality ceramic coating designed for plastic and rubber. We offer this solution and it goes hand –in- hand with our coating services for paint. Crisp, fresh, and clean. That’s the way to do it. Glass has always been a difficult subject for many companies claiming to have professional detailing skills. Most do not understand the very basics when it comes to glass itself as a material. It is much harder than paints, plastics, and metals all together. This is one of the main reasons that it will spot so easily without any protection on it. Water spots can be defined in 3 categories, light, medium, severe. The first 2 categories can usually be dealt with using very little mechanical action (polishing). Chemical removal of water spots is common for most vehicles and would be done during a prep process prior to paint correction. Whatever is left behind which spot removers do not remove, will be removed by mechanical action or polishing. Crystal clear glass looks great but requires protection as well. The answer is “clear to see”; clean glass is safer and aesthetically more pleasing for those wanting that “perfect detail”. We do also possess the tools and techniques to remove glazing or windshield scratches induced by constant wiper use. Many vehicles of late are steering away from using any type of metal finish due to high-maintenance needs. Chrome, polished aluminum, stainless steel, and other like metals are getting rarer but show up more commonly on wheels and some trim. Antiques are where we see most of the need for metal restoration. The process will vary depending on the level of damage and so does the cost. However, there is nothing better than that deep mirror finish once the time has been spent to restore. Everything is done mechanically using polishers to achieve the best results. Remember though, that’s only part of the process. Superior long-term protection is key to keeping maintenance cost down in the future and less time dealing with foggy or rusty metal period. Beauty also matters on the inside remember? Most of our services for interior refreshing are very well thought out and have major purpose beyond just presenting you with a clean cabin. Leathers, vinyls, plastics all take on organic sludge over time. It’s inevitable that oils from our skin, stains from dye in our clothes, and other factors will build up on these surfaces creating a discolored, dingy appearance. Odors are another factor to compete with. Bacteria are all around us, however we have serious solutions to not only get rid of the bacteria but also create a barrier against the return of said foe. Steam cleaning, bacteria neutralizing products, and ozone generator use will eradicate smells and stains without fail. Bright and fresh is stage 1. We also use long term BIO-STAT technology to create a mechanical barrier that will kill bacteria over time whenever it may come in contact with any surface. Learn more about this in our protection suite. Welcome to the world of precision surface tuning. The most intriguing part of our “DNA Process” is a wonder of nanotechnology. We have the ability to manipulate and protect each surface of your vehicle with the latest ceramic coating protection available today there by building an unyielding hydrophobic, scratch resistant, UV and chemical proof barrier. Achieving that drop-dead, head-turning shine is standard when working with these technologies. This unique proven technology performs as an invisible shield and is ceramic- like in hardness. We sometimes refer to them as “glass coating” indicating the molecular structures close ties to glass itself. Ceramic Pro is compatible with many materials. These intelligent and extremely durable surfaces can and will last you up to 5 years or more with non- diminishing quality functional protection and ultra-gloss. Self- cleaning ability will yield a longer duration between washes. Biomimetic coatings mimic the hydrophobic characteristic of plants that repel water and dirt in order to keep themselves clean. This is why maintenance is simpler than ever. 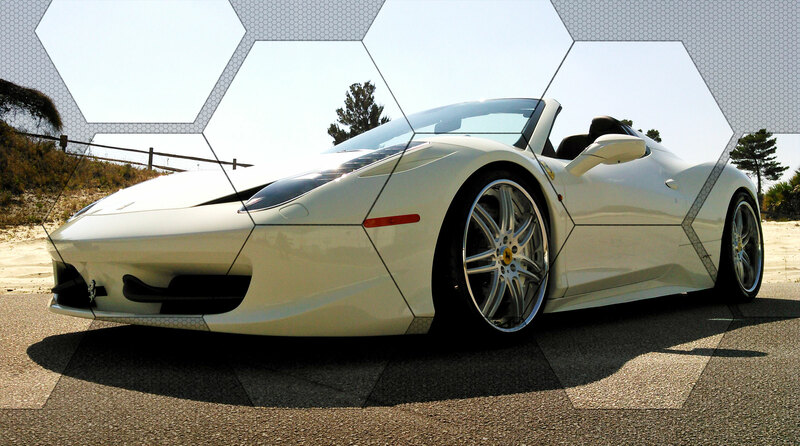 Our ceramic coating is not a paint protectant, wax or sealant that will wash away or break down over time. It is a nano-ceramic coating that forms a permanent adhesion to the paint and can only be removed through abrasion. No chemical can dissolve the coating. The coating has a 100% resistant barrier against the damaging contaminants and harsh chemicals on road vehicles are exposed to. Since chemicals cannot affect the coating, the vehicles surfaces are guaranteed to stay protected. The coating protects all surfaces from getting exposed to water and oxygen. pre-maturely aging. No need to worry. When you talk about surfaces being hydrophobic you often talk about the water contact angle of the surface. The higher angle of contact, the less dirt or liquid will attach to the surface. This hydrophobic effect will last a lifetime if maintained correctly and will look stunning all at the same time. You can be sure that even after a rain storm your vehicle will look cleaner than any other in the lot. Others will be jealous. These are the most advanced and intelligently designed products money can buy on the “nano-tech” market right now .The standards are being thrown out and rewritten as these technologies are a force to be reckoned with. Polymer waxes, acrylics, teflons, dealer coatings, and other quartz coatings are obsolete and we have proved this in so many instances. The proof is in the pudding as it were. DNA Surface Concepts offers many options on coating packages for all budgets. Stop by for a consultation today. What is crucial to our process to thrive is first and foremost, prep. Just as a painter would, we must take time to polish and correct surfaces to bring them to a degree where they have new car visual impact and are dually at a superior clan level for our coating application. Prep is undoubtedly the most important. Our facility allows us to actually control our environment and this drives quality control u to efficient levels. Simply, we need to deliver the most impact in the most efficient manner. Part of that impact comes from a finish that is true and corrected as it stands before our eyes. Paint correction will remove most, to all defects depending on what. This component of the enhancement process is to be followed by our ultra-premium protective solution. Master – detailers are amazing and they do exist. However, we are surface solution artists. Our process is unique, surgical, and quite impressive to those who care about the details. We go Beyond the Details insuring there is no question on quality when it comes to delivery. It is quite common to see most new vehicles with pre-mature surface damage, gathered during the handling process before delivery. Truth be told, it happens in all brands. New paint is straight forward to work with. However, all vehicles go through a visual inspection before making recommendations on corrective measures. Every vehicle receiving a “paint freshening” will be cleansed head to toe will receive a standard short-term treatment utilizing our electro-Si express coating. Our signature True Long-term Protection is also available and makes up 95% of business we perform month-to-month. Extra defect removal that is necessary outside the limits will be billed by-the-hour after approval. Dark, non-metallic colors will be more difficult naturally and require a bit more attention. A higher price bracket may apply. Paint correction will be similar but pre-owned cars always require some extra steps in the prep process as well as final delivery procedures. Pricing may reflect appropriate added steps. Temporary (4-6 month) Protective Electro-Si Coating standard.